Steel Buildings and steel-framed buildings are a modern, cost effective and rapid means of creating extra space for industrial, agricultural or commercial use, or even a personal hobby or enthusiasm like flying, cars or motorsports. You're probably familiar with basic steel sheds and barns, but steel-framed buildings can incorporate modern and traditional materials giving you buildings that are big, spacious and a delight to look at. The basic structure of a steel building is based on the use of a steel frame made from columns and beams made out of cold rolled steel - known as a portal frame design. Portal frames are like meccano - long metal beams that are bolted together to provide the basic structure for the building. Being steel, this means the buildings have a great strength, but also lightness compared to the same structure made in brick or concrete and as the frame is both strong and light, it can be used to span large areas giving a very large potential inner space to buildings without the need for internal supporting columns. The exterior finish to the building is independent of the frame itself. Most low-cost steel buildings are finished with a steel-skin cladding for reasons of cost, but steel buildings can covered or filled in, in a variety of materials including glass (for showrooms, or sporting arenas), to wooden panels for a more traditional look, or even infilled with brick without the need for the brickwork to support the building weight. As the outer walls are not load bearing, it is easy to add windows, skylights and doors of all sizes to the building. 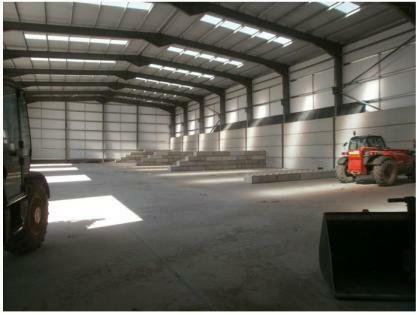 The building can also be insulated and ventilated specifically to the requirements of the job - be it covering a swimming pool, a luxury riding arena, or more commercial space such as a retail unit or warehousing. The ability to build without internal columns, makes steel buildings ideal for unusually shaped needs - like wide doored aircraft hangers or tall doored marine purposes. Again, the internal fitting is independent of the main outer frame allowing the interior space to fitted out exactly to requirements, including extra mezzanine levels, offices, storage space, high shelving racks or internal units for instance for stables or segregated storage space. Modern steel buildings are built using a portal frame structure with the frames co-ordinated into the form of bays. In use, the frame bears the weight of the building and walls. And for bigger buildings, more bays are used to spread the design to the available space. The beams that build up the frame allows the weight of the building to be held without needing supporting walls or interior columns. This frame structure provides for a huge amount of flexibility in design and allows for many types of walling or cladding and doors and windows.. The basic steel frame of your steel building can be used with different wall coverings, doors, windows depending on use. For instance whether you require insulation, fire resistance, where and what type of doors are required and where, if at all, you want windows and skylights.